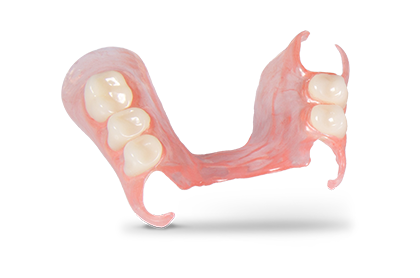 TCS® is an extremely resilient high-performance thermoplastic used for the fabrication of removable flexible partials. This biocompatible option blends so naturally with the surrounding tissue and gums that it is virtually unnoticeable in the mouth. Includes alloy free RPD framework, Heraeus Kulzer Artic® Teeth, setup and finish.